EXACTLY a week ago we revealed that Triumph had plans to launch a new model under the ‘Street Cup’ name based on its existing Street Twin. And here it is. Well, it’s still not official. 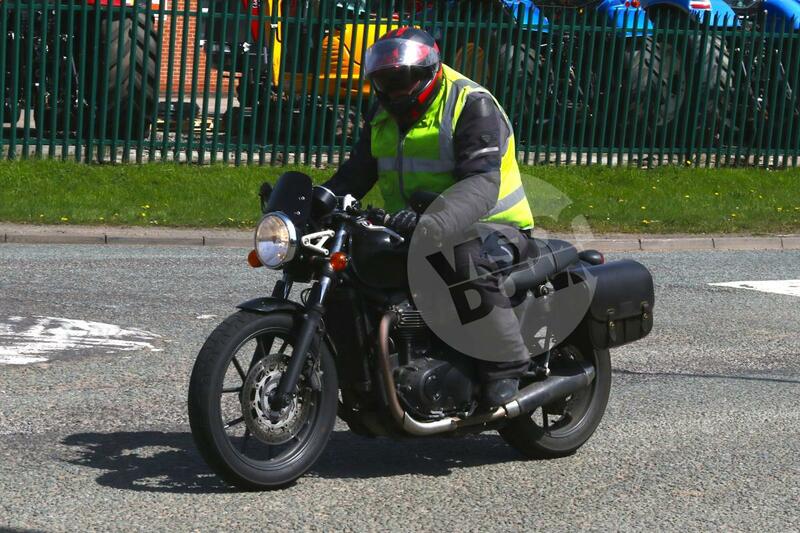 This bike is a prototype spied on test near the factory, but there’s little doubt that it’s the Street Cup. Last week all we knew was that the Street Cup was joining the range in 2017, since the name appeared on American emissions certificates, showing it to be a new model sharing the Street Twin’s engine. We said it was likely to be an entry-level café racer, positioned below the Thruxton in Triumph’s range. And what do we have here? A café-racer using the 900cc Street Twin engine as well as the Street Twin chassis and much of its bodywork, exactly fitting our expectations for the Street Cup. It’s pretty obvious that it’s a parts-sharing exercise, creating a new model for the minimum in terms of expense and development. The seat is from the Thruxton, as are the clocks and the headlight brackets. The rest is largely stock Street Twin, with the exception of three components specifically built for the Street Cup. First are the bars, which initially appear to be the Thruxton’s clip-ons but are actually a cheaper one-piece bar clamped on to the stock Street Twin risers. Second are the exhausts, which have new, black-finished silencers and a sportier style than the Street Twin’s pipes. And finally there’s the front brake, which uses a floating disc and a different caliper to that of the Street Twin. We already know that the engine tune is the same as the Street Twin, so it’s got 55hp, and the weight is understandably expected to be unchanged at 198kg dry. There’s little reason for it to be significantly more expensive than the £7,350 Street Twin, either. In fact it would make sense for it to be a direct replacement for the old, air-cooled, 865cc Thruxton, which is still on sale at the moment at £7,899. The new 1200cc water-cooled Thruxton starts at £10,400 and rises to £11,700 for the Ohlins-and-Brembo-equipped R model, so it’s in a completely different section of the market.